I’ve been playing with perl a lot lately and after recently playing with Catalyst, I moved on to Dancer. 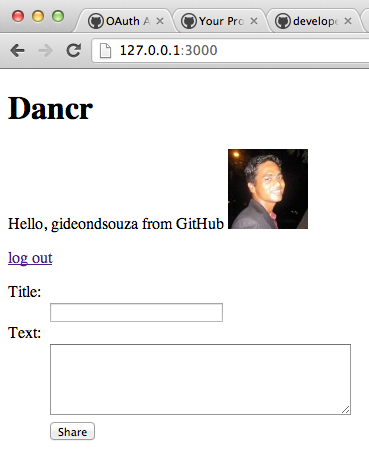 Dancer has a nice tutorial with a simple dummy blog application. The app is on GitHub here. It describes quite a few aspects about Dancer, including sessions, routes, storage and displaying pages. It’s a neat little example in that it’s hardly a few files. Naturally I wanted to get my hands dirty and wanted to try and implement OAuth authentication with github. I don’t mean by pulling a nice CPAN module (there isn’t one) but writing the whole OAuth flow myself. Fortunately I found this to be a simple task. I managed to change the authentication in the sample dancer app to login with github. I added this in a forked project. Set a session object to the username and avatar img url and use this on the masterpage (main.tt). So you can see the forked project files. I just changed dancr.pl and main.tt. I also removed login.tt since there is no need for that. You have to add your application with github and then you’ll get a client id and client secret. I added two variables on the top and the login route changes to just redirect the user to githubs login page. If the user allows your app, then github will send a special code to your app by calling your callback url. This route sub uses a helper method that looks like the following, it parses the query string into a hash.